George Eliot is one of my favorite authors. She herself seemed like a character to me when I was in high school and learned ‘George’ was really Marian Evans. She not only adopted a male name but also dressed as one. She wrote many great novels, including Middlemarch and Silas Marner. 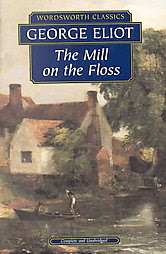 The Mill on the Floss is Eliot’s only tragic novel and the most autobiographical. It tells the life story of an intelligent and sensitive girl, Maggie Tulliver, daughter of a mill owner. Maggie’s early life involved an intense hero worship of her brother, Tom. The first two sections “Boy and Girl” and “School-Time,” I found rather dry and it took me quite a while to get interested. It can be summed up like this: Tom is a little bully and Maggie is loved starved and mostly ignored, unless she’s getting herself into trouble (often). She is criticized by most of the family as headstrong and unattractive because of her dark looks. The only person to understand her somewhat is her father who fearing she will end up unloved, makes Tom promise to take care of her when he dies. The action picks up in “The Downfall.” Maggie’s father loses everything, including his mind, after losing a lawsuit against Mr Wakem, a wealthy lawyer. Mr Tulliver hardly pays poor Maggie any attention. He is obsessed with getting even. He makes Tom promise to get back the mill and avenge the family. Unfortunately, Maggie is close friends with Philip Wakem, the deformed son of the lawyer. Maggie is torn but gives him up for fear of upsetting her family. Maggie grows into a gorgeous dark-eyed woman, receiving attention for being an exotic beauty but misunderstood because of her intelligence. Maggie finds herself trying to choose between two lovers. She feels an obligation to Philip to whom she feels morally obligated, even though she’ll lose the love of her brother. The second man is Stephen, sweetheart of her beloved cousin, Lucy, to whom she has an intense physical attraction. There is no right answer. The problem with Maggie is that she thinks too much. She is an emotional mess as well. The emotion she wallows in most is Guilt. She believes that the key to her own happiness is to deny herself of what she wants in favor of what others expect of her. Philip calls it “a narrow self-delusive fanaticism.” I guess Eliot was trying to say that a woman of that time could hardly follow her own heart without there being dire consequences. They are all about appearances. I enjoyed this novel after my struggles with the beginning. The characters are well written and realistic. Even the town, St Ogg’s, feels like every small town, with everybody knowing everybody else’s business and everyone has an opinion. As for the end, grab a box of Kleenex. I give this book 3/5- it would have been 4/5 if it wasn’t for the first two chapters. Thanks for your review of this. I would like to read this book and Middlemarch after enjoying Silas Marner so much. I need to read classics this year. I planned to, and I have been really slack about it. Great review! This book is on my shelf, but I have yet to read it. Now I know a little bit more about it (and the author!). I LOVED Silas Marner when we read it. But I could NOT get into Middlemarch. Maybe I should try this one. Which did you like the best?? Middlemarch is a big, tough book. It took me a second try before I got into it. The Mill on the Floss has more story- more conflict, I think. I liked it better. I have Adam Bede on my TBR list too, but I think I'll wait a few months before I read it.